Currently viewing the tag: "wrench"
I have to admit, I’m not entirely sure how these work, but they look like something from the end of Inspector Gadget’s forearm. They’re for precisely torquing large bolts in tight spaces, apparently mounting on the end of a long handle and accepting hydraulic feed and return lines. Unless I miss my guess, an internal pressure regulator determines how much torque is exerted. If anyone’s ever used one of these, what are they like? 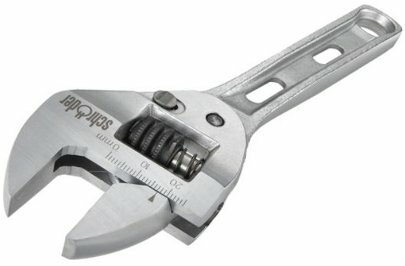 The baddest torque tool I’ve ever used was a 3/4″-drive impact wrench, which is probably a pushover compared to these suckers. Ignition wrenches are one of those tools you’ll never need until that one moment when Murphy’s messing with you, and then nothing else will do. Normal wrenches have a 30-degree offset in the head to allow for rotating hex bolts by thirty degrees at a time, but that’s too much for some very tight situations. That’s where ignition wrenches come in. With a 15-degree offset on one side and an 80-degree offset on the other, you only need five degrees of rotation to spin a bolt. Tedious, yes, but sometimes those small increments are all you can manage. Pricing is reasonable from Craftsman, at $20 for a set of eight metric wrenches, and the same price for eight inch wrenches. Snap-On, naturally, has similar options at the stratospheric price of $224. Personally, I’ll take 91% off and go for the Craftsman set. 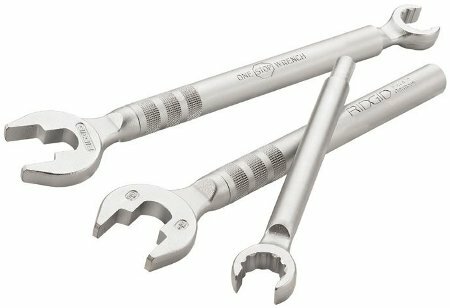 Whether you call it a Saltus Wrench or a flex combination wrench, it still looks like you left your sockets alone in the dark with your wrenches for too long. I remember running into one of these wrenches in my dad’s toolbox as a kid and thinking, “What the hell is this for?” Given the proliferation of ratcheting box end wrenches and other innovations, most people probably don’t run into these wrenches anymore. The open end and the socket on one of these wrenches are the same size, and the socket isn’t removable. The socket usually rotates on the end of the wrench, somewhat like a socket on the head of a breaker bar — this setup might get you into some areas too tight for a ratchet and socket. Alligator or “Goat” wrenches have been around for a while. The name “alligator” alludes to the shape of the jaws which look like alligator jaws, but I’m not sure how the name “goat” became attached to these type of wrenches. Two different companies market what appears to be the identical wrench under the two traditional names of Goat Wrench and Alligator Wrench. 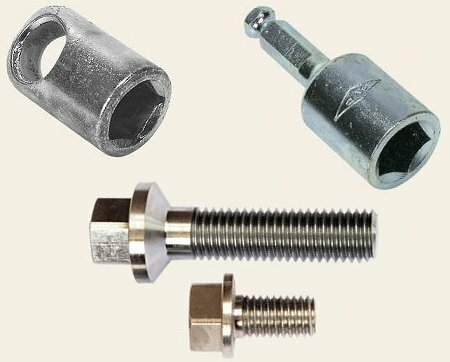 Along with the traditional use of turning iron and steel pipes, the wrench has been re-purposed for turning hex and square nuts from 9/16″ to 1-1/8″. It’s designed so you can use ratcheting action to turn nuts without repositioning the jaws. The 12″ long wrench also has 3/8″ through 5/8″ thread restorers — we assume the middle one is 1/2″ — and the funny-looking jaw can also be used as a hammer. Made from forged steel and chrome plated, the wrench weighs 1 lb. 7 oz. 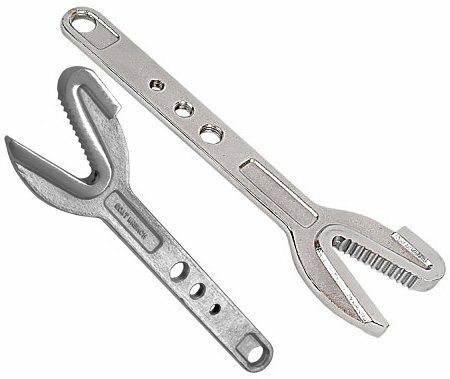 You can purchase an Alligator wrench for about $73 shipped from Craftwork Tools. GMP Tools manufactures pentagonal head bolts to secure manhole covers. That’s right, not square, not hex, but pentagonal — another case of security through obscurity. Of course, if you sell bolts with heads that have an odd number of sides you need to supply the corresponding tools to turn them, so they also sell two different sockets: one with a 7/16″ hex drive for impact tools, another with a 19mm hole which you can turn with a rod. You’ll see tons of wrenches that are insulated by coating the handle, but to meet the 1000V ATSM standard rating, Klein does something a little different: they embed two ratcheting box end wrenches in see-through plastic so you can visually confirm they aren’t touching. Grab one end of the wrench and there’s no path for the current to flow to the other. Made in the USA, Klein’s Lineman’s insulating box wrench features 9/16″ and 3/4″ ratcheting 12-point sockets. There’s no reversing mechanism; to switch from tightening to loosening, just flip the wrench over. They mold grooves into the handle so you can get a good grip of the wrench. It’ll be interesting to see if they come out with similar insulated wrenches in other sizes. For now, you can purchase one of these insulated wrenches for $44, except the Klein Connection says you must order this wrench in multiples of three.